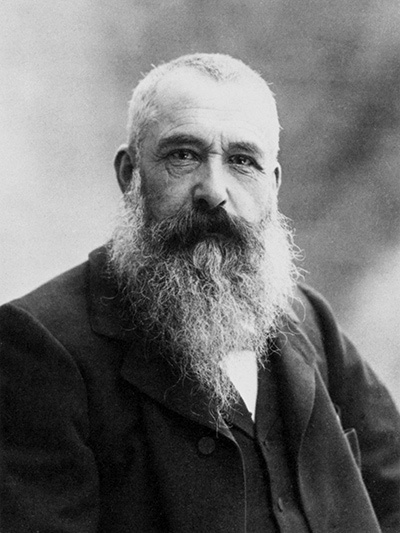 19th century French artist, Claude Monet, is synonymous with impressionism. In fact, the impressionist movement was named for one of his own paintings, Impression, Soleil Levant or, Impression, Sunrise. Monet lived well into his eighties and left a huge body of work for future generations to enjoy. Today, appreciation of his work is at an all-time high with his most famous paintings fetching record-breaking prices at auction. Examples of his work can be found in all of the major art galleries of the world, and replica imagery is used commercially in many fields from stationary to fashion. As a young artist, Monet was mentored and influenced by Eugene Boudin, a great pioneer of outdoor painting or en plein air. Boudin's guidance undoubtably emboldened Monet's work, encouraging him to embrace a much freer style of painting, expressing what he saw in nature rather than planning the composition in the confines of a studio. However, it wasn't until he began studying under Charles Gleyre in Paris in 1862 that he began to explore new techniques to express the effects of natural light in landscapes through the use and application of colour. It was while under the tutelage of Gleyre that Monet also met and befriended artists like Manet, Renoir, Sisley et al who would go on to be revered fellow impressionists. The term impressionist was first coined by art critic Louis Leroy, who intended to insult Monet's painting, Impression, Sunrise. Monet and his friends had received little support for their new techniques from the art establishment which was rigidly policed by the Académie des Beaux-Arts, so in April 1874, Renoir arranged an independent exhibition for his friends whom he had named The Anonymous Society of Painters, Sculptors and Engravers, in order that they may display their new style of work out with the confines of the Salon de Paris. Leroy was apparently so unimpressed by the exhibition of Monet and his contemporaries that he stated the work lacked refinement and was loosely executed making it seem like a preliminary sketch, an impression of what the final painting could be. Naturally Monet and his fellow painters were delighted with the moniker and a new school of art was born. Ironically, Impression, Sunrise is not typical of Monet’s work and actually looks more Turner-esque; it displays blended, muted colours rather than the short, defined brush strokes and vivid colours which now define his paintings. The Anonymous Society of Painters, Sculptors and Engravers continued to exhibit their work together well into the 1880's. Although Monet painted many fine portraits (Madam Monet in a Japanese Kimono - 1875) and often incorporated figures into his work (Women in the Garden - 1867), his great love was landscape and seascapes. He spent a great deal of his time devoted to finding a way to accurately depict the effect of light on scenes. Through this process he began to focus more and more on colour and less on form, believing that the colours and the way they were applied to the canvas were more authentic than the details of the composition. He developed techniques of paint application, small dabs of bold unblended colours, which were so effective that they actually described the light around a thing rather than the subject itself. Today, we are all familiar with the effects Monet's methods can produce, but at the time they were so ground-breaking that they were subsequently used as a template for greats like Seurat and Van Gogh. Monet's obsession with light and how it changed the appearance of subject matter prompted him to paint in series so that he could capture the subjects at different times of day and in different weather. Indeed, the speed with which he would have had to work while the light changed could have informed his, now famous, style of bold colours and dabbing application of paint. There are of course many examples of these series, however the first is thought to have been seven paintings of Saint-Lazare Station in 1877. The paintings are Monet at his atmospheric best, describing the huge dominating engines surrounded by the ethereal clouds of steam, at once wispy and engulfing. However, when they were exhibited later that same year, they did not impress the critics. Paris was still not ready for the innovation of impressionism. Monet continued to practise his work on the description of light, travelling to the Mediterranean and London to find subject and light to inspire him where he painted a series of Venetian cityscapes and, in London, a famous series of The Houses of Parliament among others. Each of these series is as compelling as the next. Perhaps the best known of Monet’s series, however, is the Rouen Cathedral (1892) which was ground-breaking in many ways. The series consists of twenty-six paintings of the cathedral in various different lights. However, the innovation was not the different qualities of light, rather the fact that Monet did not focus on the grandeur of the structure, but the colours and texture it produced. As a result, the subjects of the paintings are cropped sections of the building. This lack of attention to the subject and focus on the light and emotions was a complete departure from the traditional artistic rules of the day. Monet found it freeing, and when he finally showed them three years later, the public agreed. In 1883 Monet found and moved to a house in Giverny. With its two-acre garden and its idyllic location in the countryside, this place was to become his most intense and lasting obsession. Over the next fifteen years, Monet devoted himself to developing and landscaping his property. He built several studios, a Japanese garden with bridge and imported countless lilies from the four corners. He created an oasis which would inspire his painting for the rest of his life. Some of Monet's most famous and recognisable work was created during this period. He produced several series of Water Lilies (1915-1926) and many views of the garden including Weeping Willow (1919). The process helped him develop a style which became almost abstract in its description as in The Japanese Footbridge (1922), but always, there was colour and light. If Monet's most important works showcase his skill with light and colour, then that would include all of them, and certainly several of them have already been highlighted here. However, there are two more paintings which should be referenced here as truly seminal works for there revolutionary handling of the subject matter. Woman with a Parasol (1875) was in fact a portrait of the artist's wife, Camille. While it is a beautiful picture even to the layman’s eyes, what is truly exceptional about it is the fact that Monet has chosen an angle which obscures his wife’s face in shade. Not only does this make us look closer to see her beauty, but also allows for what light there is, to dance around her and produces a magical quality. This shows Monet’s innate genius at its best. Finally, no review of Monet's work would be complete without mentioning Poppies (1873) which is perhaps his most recognised and copied work and can today be found in the Musee d’Orsay. The painting is almost a perfect example of all of Monet's techniques; from his early muting of colours to evoke atmosphere of a warm day, to the almost abstract rendering of the mother and child which he came back to at the end of his life. It is the quintessential work, using colour and technique not only to describe light, but atmosphere and emotion. Although the stuffy critics of Monet’s day took some time to warm to his skills, it is certainly a testimony to his genius that so many of his paintings today are considered not only beautiful and relevant, but important markers in the history and story of art. Although Monet only received acclaim later in his life, after his death his work became critically recognised and very valuable indeed. In recent years Monet's paintings have sold for tens of millions of pounds at auction. However, regardless of price tags, the true legacy that Monet left behind is the freedom of creation that the impressionist movement began for all who came after them. When we look at the great works of Van Gogh and Gauguin it is hard to deny that Monet's fine hand did not inform their techniques. Impressionism remains one of the most recognisable and loved styles of art and is still influencing young artists today. Monet and his devotion to light and colour has left us with a vast well of creative inspiration and his genius will continue to excite us for generations to come. Disclaimer: MonetPaintings.org is a personal website covering the career of famous French painter Claude Monet, but is in no way an official website for Claude Monet and MonetPaintings.org does not claim to be that in any way. The Estate of Claude Monet and their presence hold all necessary copyrights and licences for all of his paintings and other works. All prints, paintings and photos included in MonetPaintings.org are provided as an affiliate to Art.com who hold necessary permissions. Art.com pay us small commissions based on any prints or paintings that you buy as a result of using this website.